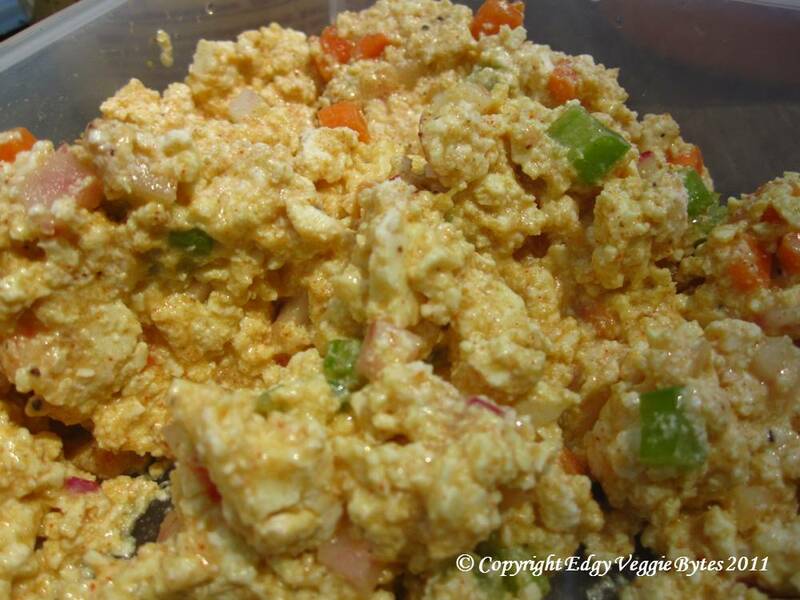 This is essentially a recipe for egg salad, but tweaked to be vegan. Even though I eat eggs, I don’t like the egg-y taste that regular egg salad/potato salad/coleslaw has, so this I love how this comes out. The main thing is to find vegan mayo like Nayonaise or the reduced fat mayo from Trader Joe’s to hold everything together. You can add anything you like, but this recipe has things that are on the crunchy side like celery and carrots. You can definitely eat it plain, or with crackers, but I like putting a thick layer of it a sandwich to make it a more of a meal. 1. Mash the tofu using a fork, until it’s all broken up. 2. Add in all of the spices and mix until it looks uniform. 3. Mix in the remaining ingredients. Refrigerate until ready to serve.